We’re not saying you have a George Constanza problem, but over time, you’ve loaded it up with so many odds and ends – and credit cards and receipts – it’s hard to locate what you actually need when you need it. Here, how to streamline and lighten your purse-load. 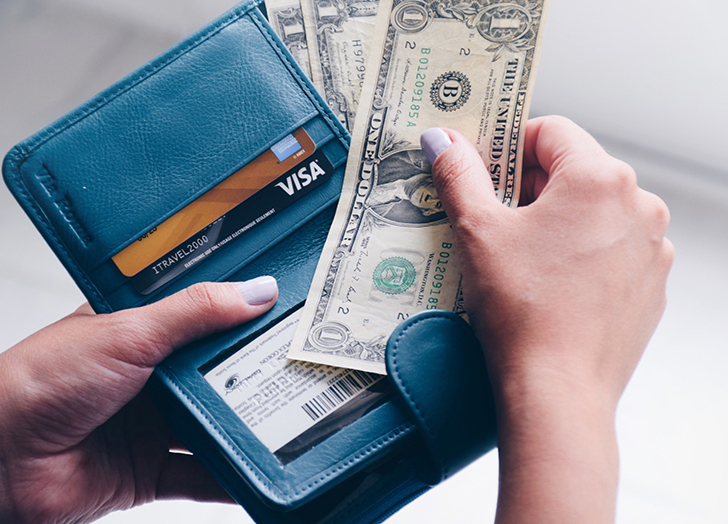 It’s a theft-prevention thing: The more credit cards you carry, the easier it is for someone to rack up a bunch of debt should you accidentally misplace your purse. In addition, if your wallet goes missing, it’s a colossal pain to get a temporary card to shop with while you wait out the arrival of new replacement cards. Instead, stock your wallet with just one major credit card, plus a backup – then leave the rest at home. We live in a debit-card world, but cash is still king. Make it a rule to always tuck a $20 in a safe place where you know you won’t spend it unless you’re in a jam. Add to that a few singles, which are good to have on hand for smaller expenses or when there’s a minimum spend to pay with a card. As for any quarters and dimes you get back? Off-load them in a jar on your nightstand that you’ll eventually cash in so they don’t weigh you down. It may seem like a no-brainer, but lose these, and it’s like you’re on the fast track to identity theft. Not to mention, it’s quite a hassle to replace them. (Oh, the sheer volume of paperwork.) Unless you’re traveling – or updating some important life documents where one of these items is required – it’s best to leave both in a locked safe or filing cabinet at home.